This is already my favourite spoof of the blaxploitation era because it's the funniest and also the most accurate recreation. To be more precise, it's a homage to the sub-genre where one man takes on all the odds - Shaft, Superfly, The Mack... as opposed to the films where women took on all the odds - Coffy, Foxy Brown, Cleopatra Jones... and nothing to do with the horror subgenre where every iconic monster movie (up till then) was remade for a black audience. 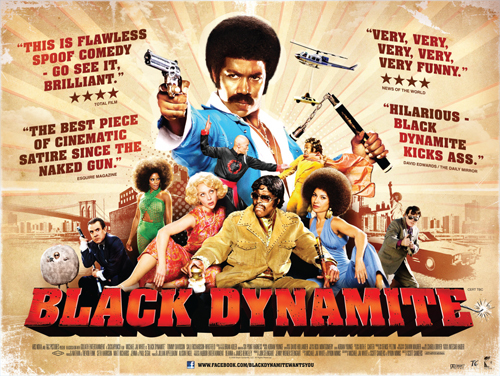 Black Dynamite is a labour of love and is itself low-budget. One of its many strengths is the script, cleverly weaving in so many familiar elements from the originals, as well as layering in the technical distractions the original actors would have had. It's as much an homage to lowest-budget cinema of this era, as it is to this particular genre, making it accessible to anyone with a fleeting experience of early 70s exploitation. The star, Michael Jai White (Spawn himself), co-wrote the story and the script. A dream role for someone who obviously enjoys the films as an actor and a martial arts stunt performer. The huge cast includes a short cameo from Arsenio Hall (Coming To America), and Sally Richardson-Whitfield (I Am Legend) as Gloria, Dynamite's 'black power' girlfriend. While many of the action scenes are played for laughs, Michael Jai White also demonstrates dangerous-looking nunchuck and kung fu action in some very impressive long-take fight scenes. While he's aiming at channeling Jim Kelly (Black Belt Jones, Enter The Dragon), he more closely resembles a pumped-up Shaft, which is no bad thing. The fashions, the language, the hairstyles are funny because they're accurate, rather than exaggerated. When shoes and hair are that high, they don't need to be any bigger. And the soundtrack is so accurately done, I had a hard time telling new music from old - new songs were recorded using authentic analogue techniques and contemporary instruments. They blend completely with library movie music in favour at the time. Similarly, stock footage of explosions and stunts intercut smoothly with the intentionally 'badly shot' footage. Not since House of the Devil will you be so confused knowing what year you're looking at. Cleverly, they didn't create the look the hard way - by degrading the footage electronically, but by shooting it all on a 16mm stock, a grainy and very contrasty look that matches cheap 1970s' 35mm. Faltering zooms, microphones peeking into view... aren't laid on too thick and are sometimes so subtle that they make the actual onscreen goofs look intentional. There's one fantastic back-projection gag that made me yearn for more Police Squad! It's all too short. Several scenes have been abbreviated into montages to keep the story snappy, though after seeing the deleted scenes play out in their entirety, you can see that they weren't working or funny enough. I'd enjoyed the more sporadic spoofs like Undercover Brother and Austin Powers in Goldmember which played the giant afros for laughs. But this is an intensive, better researched, reverential movie for fans of the originals who enjoy and embrace their style, music and politics. Released last year on DVD, this is also available on blu-ray in the US and Germany. The DVD has deleted scenes, and some fun, informative featurettes on the movie and music production that don't outstay their welcome. The Black Dynamite trailer is still live on Icon Home Entertainment's website for the movie. I previously waded into the blaxploitation horror film cycle here.